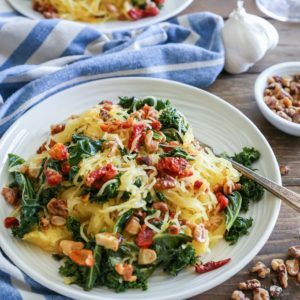 Roasted garlic and kale spaghetti squash with sun-dried tomatoes and walnuts makes for a comforting, low-carb meal requiring only 5 main ingredients! Plus the recipe is simple to prepare! I know. Nothing replaces a steamy pile of actual spaghetti, but for those of us who are looking for comfort food that is easy on the digestive system, this meal fits the bill. 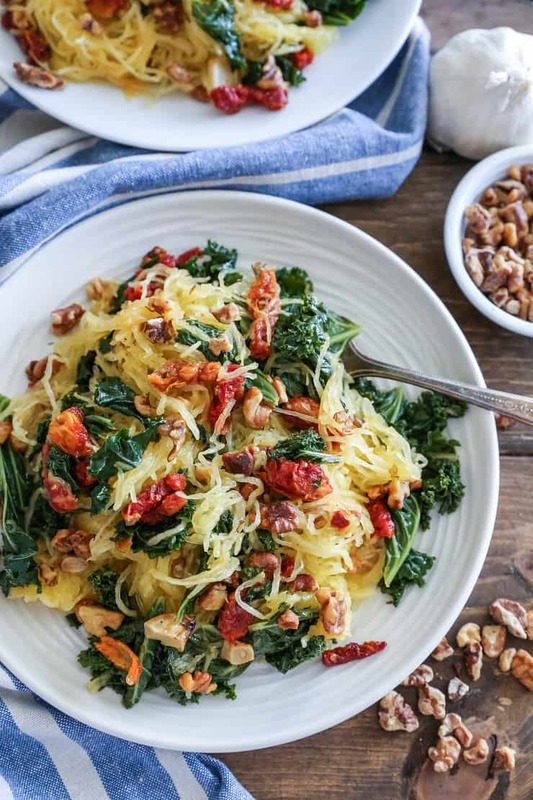 It has contains vitamins and minerals from the spaghetti squash and kale, a boost of flavor from the sun-dried tomatoes and roasted garlic, and some protein and crunch from the walnuts. This simple recipe requires only 5 main ingredients (not including sea salt and olive oil), and yet it’s so stinking flavorful. This recipe will feed two people comfortably. Or if you’re me, it will feed you twice in one day…lunch + dinner. If you’re feeding more people, you can easily double or triple the recipe. While roasting spaghetti squash is a bit of a time commitment, it can easily be done up to 3 days ahead of time, making the preparation process a little easier. If you prefer fresh cherry tomatoes over sun-dried tomatoes, feel free to swap them out! Use chard or spinach in place of kale. Replace the roasted walnuts with roasted almonds, pecans, cashews, pine nuts, or pistachios, or go nut-free. Make this a meat-lover’s dish by adding grilled or rotisserie chicken. To keep this recipe vegetarian but add a protein boost, add chickpeas or a sunny-side up egg. For some citrusy flavor, add a couple tablespoons of fresh lemon juice and/or lemon zest. 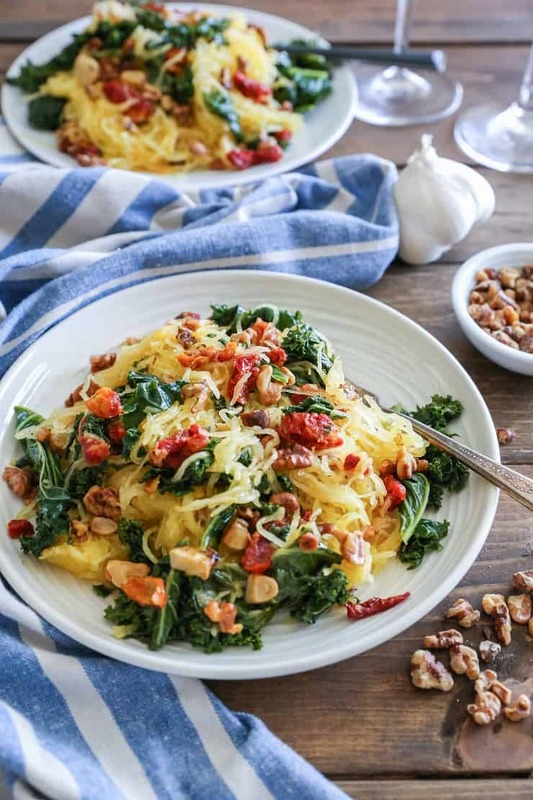 If you make this Roasted Garlic and Kale Spaghetti Squash, please feel free to share a photo and tag @TheRoastedRoot on Instagram! Roast the spaghetti squash according to these instructions, along with the garlic. To roast garlic, cut the top off, of the bulb, drizzle with olive oil, and wrap in foil. Place in the oven with the spaghetti squash for the whole duration of roasting. Roast the walnuts for 5 minutes if desired. When the spaghetti squash and garlic (and walnuts) have finished roasting, allow them to cool enough to handle. Once cool, use a fork to release the strands of spaghetti squash and place in a large bowl. Peel the garlic cloves, give them a rough chop, and transfer them to the bowl with the spaghetti squash. Heat the olive oil in a large skillet over medium heat and add the chopped kale. Cover and cook until kale has wilted, about 3 to 4 minutes. Add the sun dried tomatoes, along with the spaghetti squash, roasted garlic, and walnuts. Continue cooking and stirring until all of the ingredients are well-combined and heated through. Add sea salt to taste and taste the spaghetti squash for flavor. If desired, drizzle a couple tablespoons of lemon juice over the spaghetti squash for added citrusy flavor. Serve and enjoy! This looks so good! I’d be all about this, especially with an egg on top. And that lil science moment was actually SO fascinating! Who knew?? Ha! I’m glad you were tolerant of Science Monday…it’s a bit much, I know..but I couldn’t help but spew my newfound wisdom 😉 Cheers to putting an egg on it! I’m in love with this recipe. So simple, so flavorful. I need to make it happen very soon!! I was never the best in science class, but I followed along and found this interesting. I eat better now and work out harder than I ever have and barely break even, but that’s what getting older does to you! My ultimate goal is to fit in my jeans, so I guess I’m doing ok. 🙂 This spaghetti squash will keep me on track and I’ll enjoy every bite! Helloooo beautiful! This looks so flavorful and delicious- perfect just the way it is! Gotta give it a try soon! I have to be honest, spaghetti squash isn’t usually my thang, but you make it look SO GOOD and full of all the best flavors and textures. Only you could do this to me. So funny, I’ve read research that had a similar conclusion recently! I’m so with you, it would explain why I could burn 1,000 calories in a workout on the daily, yet not budge on the scale whatsoever. Diet DEFINITELY matters more when it comes to weight, but like you said, exercise has so many benefits, including a better physique & muscle definition, a stronger heart, endorphins & mood boosting effects, etc. How would you alter this to make 4 servings? Thanks! 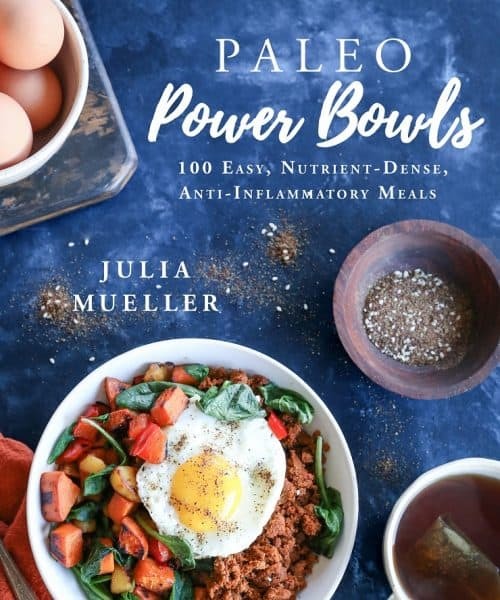 You can double all of the ingredients – so pick up 2 spaghetti squash, 2 heads of kale (or 1 will suffice if you aren’t concerned about having a lot of greens), 2/3 cup of sun-dried tomatoes, and so on. Let me know if you have any other questions! Enjoy! I’m not much of a spinach or kale person, but I think fresh basil would taste amazing. Used to get angel hair pasta with garlic, tomato, basil and chicken at a specific restaurant. It was so good that I always ordered the same thing. As a passionate pasta lover, I am very surprised I haven’t tried this recipe yet. Can’t wait to prepare and taste it soon. Goodness, this is fabulous. I used spinach and almonds because that is what I had on hand. Even sweet hubby, who doesn’t like squash liked this dish. Made this tonight and had it in a bowl with pulled baked chicken! Wow! Perfect winter dinner, thanks for sharing. One head comes out to about 4 cups loosely packed 🙂 You can definitely use the pre-packaged kale..makes the process easier, too! Do you have macros for this recipie? Do you have the nutritional info for this recipe? I also added shrimp and it was delish!!! More specifically, in addition to the nutrition, what constitutes a serving size? I started with 1 cup as a side dish. This was awesome! I’m vegan, so with all the roasting going on, I put in a tray of chick peas with za’atar. It was great with it. I also added dairy free parm cheese and red pepper flakes. Fab dish! Thank you!! I was just wondering how you got your meal to look so beautiful! Mine turned out muddled. I drained my squash and it still seems too wet. Any tips for next time? Also, where do you get a small head of kale? Im in illinois and all our kale is in whole leafs in bunches or all ready chopped kale in bags. Is there an amt i could use? ie: 1 cup packed kale…etc. This is really interesting! 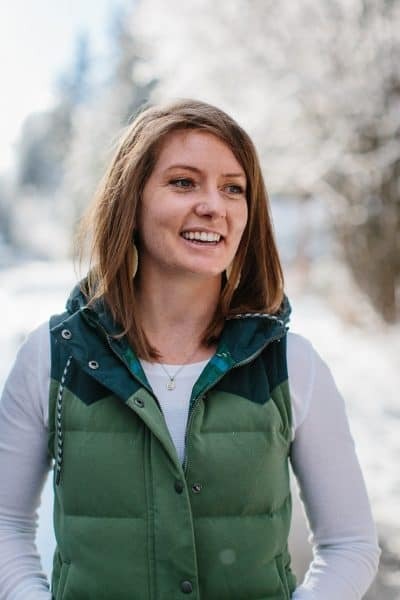 Love the story behind the recipe! This is one of my favorite things to order when we go out for Chinese food! Can’t wait to give it a try! Just made this for lunch and it’s pretty good! Mine turned out a bit oily), but the flavor combo is pretty good. In my opinion, the walnuts are very necessary and add a perfect amount of crunch! I added some red pepper flakes for a bit for diversity on flavor. Will make again! This is one of my favorite recipes! I usually add some chicken for protein- it’s a hit for everyone in our house! Thank you so much for sharing this! Great recipe!! I also added Mama Lil’s peppers to it and home made Kebbeh. This was incredibly delicious! I can’t wait to try more of your recipes!